Interesting oven testing story 😀 I always can't get my recipes right when I tried out a new oven. It always takes quite a while to get used to it. But your quiche turned out really good. I'm sure you'll have a lot of more baking fun to come. @SteelCityFlan It's a little countertop one….can't wait to start baking cakes in it too! Aren't you on holidays?? @MaryMoh Thanks! I picked a quiche because I figured there was less of a chance of it going wrong than with a cake…. Mum always said to me that gas is better than electric, even though we have only ever used gas. i love the little electric oven we have to make small meals. I hate wasting electricity. So kisses to your oven, your tart pan, and yourself? This is a beautiful quiche made from scratch : ). Lucky you to get a new oven!! With a rotisserie function as well?! Jealous! I've always wanted one of those… And the tart looks delicious as well. Looking forward to more wonderful treats! Delicious!!!! Your quiche looks out of this world! I could easily eat the entire thing in one sitting, no problem! Also, congrats on the electric oven – I think having one of m own would make me feel less guilty about baking things, particularly when it is hot has heck outside and would require my AC to work double time! It sounds like you didn't take long to get adjusted to your new oven because your quiche looks delicious! Ha ha, a great day of oven testing. Yay for new oven. 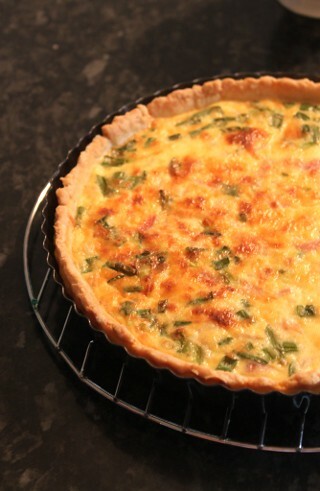 The quiche looks fantastic. I find it helpful to have an oven thermometer sitting in the oven (they're not expensive), because I find with my (electric) oven, it takes quite a long time to preheat. Hope you have loads of fun using your new oven! Your quiche looks perfect! The tart looks great! I'm so proud of you, Von. You did a great job on this one. Have a fun day! Looks great!!!! Here am I dropping by for the first time. Great blog you have!! This is the most gorgeous Quiche, Von! When I discovered you in January, I was enthralled, and I just spend a very enjoyable hour going through so many of your cooking and eating adventures again today. You are truly amazing. Your photography is excellent. I loved the buns and little cookie kissed… and I would love to get your new posts in my mail. I will look to see if you have that feature, but if not… please add it on! I thing it may good to eat that I saw recpies in ur blogs……….. 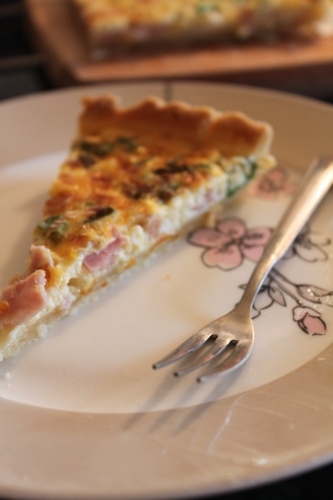 I just love the tart with the mixed chopped scallions and basil, it is mouth-watering really, this is breakfast time and I am already feeling like eating! When I travelled to Argentina, I was in one of those buenos aires apartment and I learnt a lot of receipes to learn how to cook steak and pasta. Now I can call myself experienced!